Low Carb Smoothies | Delicious vs. Nutritious! Just like in our low carb mug cakes post, Matthew and I go head to head in a Low Carb Smoothies, delicious verse nutritious challenge! I was the defending champion from the mug cakes going into this second round, but we can't really know if I won again until you make both and give us your feedback! Watch the video below to see how we make them, and taste test each others at the end. The delicious version of the low carb smoothie tastes more like a milkshake, and the addition of the xanthan gum really gives the smoothie a nice thick consistency. You get the perfect balance in taste of the coconut and chocolate, while reaping the benefits of the protein and fat in this smoothie. It's light enough for a pre-workout meal and delicious enough for a post dinner dessert! When drinking the nutritious version of the low carb smoothie you know you are giving your body some essential nutrients. And, honestly, I know I can be a bit harsh about Matt's smoothies, but they are actually really good. Personally, I'm not a fan of drinking my calories so this wouldn't be my go to, but if I needed something cold and nutritious to jump start my day or keep me going post-workout I would definitely make this low carb smoothie! Low Carb Smoothies: Which Do You Prefer? If you're looking for something that packs more fat, but still satisfies your sweet cravings you can give our I﻿﻿ced ﻿Keto﻿ Coffee a try! 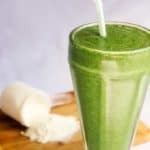 But, if you're looking for something similar to the nutritious low carb smoothie you should give Matt's original Keto Green Smoothie a try which is the inspiration for his smoothie in this recipe post! Don't be scared to make any alterations to the smoothies below, but most importantly don't forget to make both Low Carb Smoothies and comment on which you think wins this round! Recipe can be quickly added to MyFitnessPal - Search "Delicious Low Carb Smoothie"
Add all the ingredients into a blender and combine well.